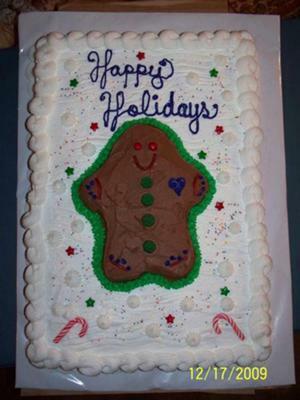 For this gingerbread man cake, I made 2 sheet cakes and this is 2 layers. With a small gingerbread man on top. I used 4 1/2 mixes on this one. I iced in buttercream and used candy pieces as decorations. ANOTHER GREAT ONE, SCHOOL WAS HAPPY I BET. LUCKY BAND CLASS..
Wow, that cake looks so pretty and yummy. as always good job.